In Column 329 of THe Magic of GO( http://www.yomiuri.co.jp/dy/columns/0001/329.htm ) Rob Van Zeijst make the claim that the sequence from move 21 on involves a tesuji related to the 3-4 point low approach two-space high pincer press cut. I have trouble seeing this resemblence. Can anyone point it out? Rich: he means the driving tesuji; in a sense, a ladder that doesn't quite work, but in failing allows the player to build power. Compare the examples with the sequence up to . 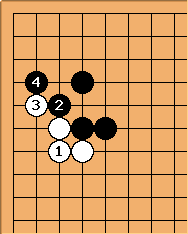 W ( at least in the games I play) often responds with 3 and 4 gives B really good shape. with A as an important point for both sides. ( Again a caveat: this point is not always a vital point. Either through reading or through a good feel for the shape, it is important to know if it is vital in a particular situation. ) It is a move that one should consider for both sides. Of course this is a simple example of the phenomena. Where a presumably plays the role of 1 in the first diagram. Frankly I don't see the similarities. Rich: Hi Thad. Sorry if I was not clear... but I really don't understand where you got the above tsuke-nobi information from the article. They are different, rely on different tesuji and different shape principles; one is about power building, the other about efficient eyeshape. 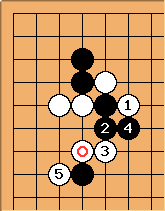 Alex: The marked White stone threatens this application of the driving tesuji if Black plays elsewhere. This is better than playing as an atari at , which is aji-keshi. I think that's the similarity that's implied.